These potatoes will knock your socks off, as long as you like shrimp, bacon, cheese and potatoes. ;) I was a little weary about putting shrimp in them, put they turned out great! 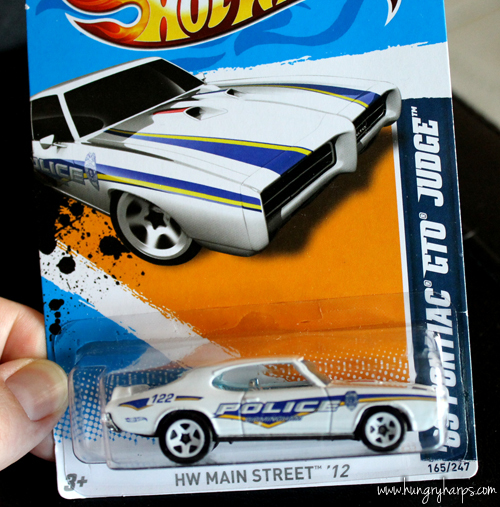 But first I must share a bit of my Pontiac GTO love with you. 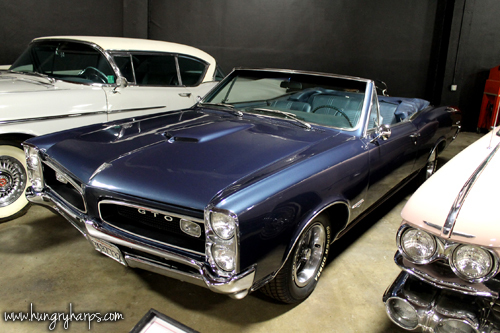 ♥ The Pontiac GTO is my favorite car, all-time favorite. If I were to win the lotto, there would be a '65 or '66 sitting in our garage, but until then I am just a die-cast GTO collector. 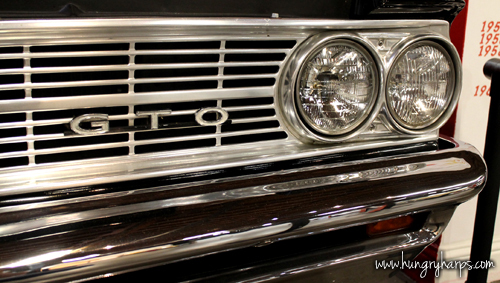 Anytime I see a GTO, it's a special moment. 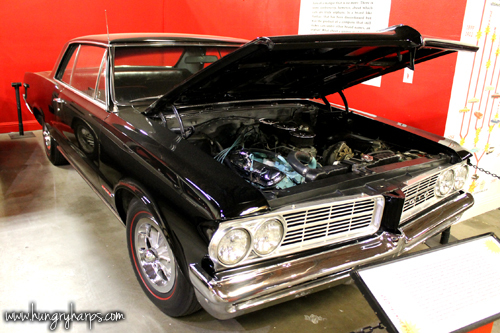 :) This weekend we went to the Sacramento Auto Museum and were able to see two of my favorite beauties! And then Mr. Hungry Harp spotted this for me at the grocery store. How freakin' awesome?!? These potatoes are easy and delicious, mostly delicious. 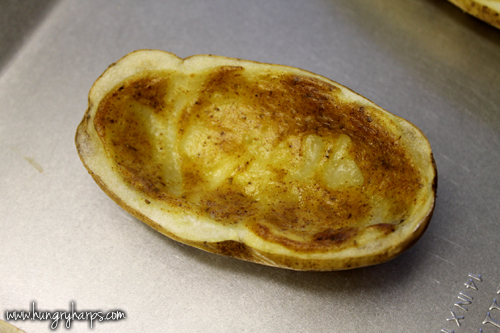 :) Ok, so first I cut the potatoes in half lengthwise and hollowed out the center. Using a melon baller, the job was easy - using a regular spoon is possible, it just takes a bit more finesse and time. ... and baked for 30 minutes. 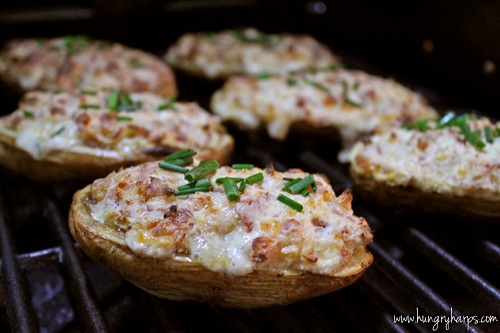 stuffed the potatoes until they couldn't be stuffed anymore. 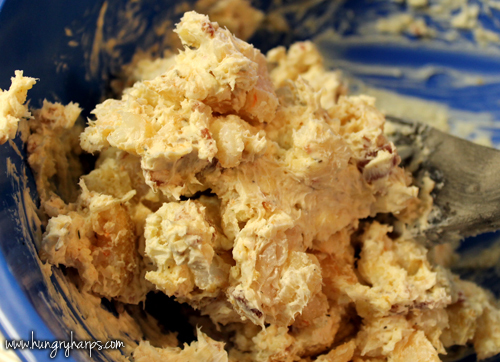 ;) Really until the mixture ran out, which will leave you with heaping stuffed potatoes! These could be baked in the oven, but I opted to keep the house cool and use the bbq instead. When the cheese was melted I added chopped chives to the top. 2. 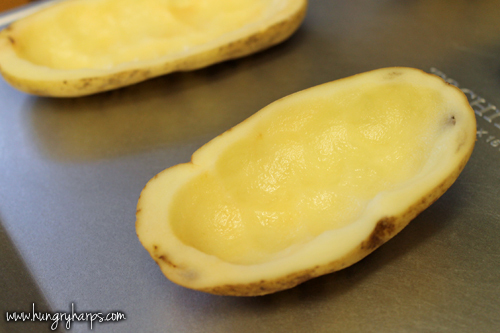 Slice potatoes in half lengthwise, scoop pulp out of potatoes leaving ¼ inch shell. 3. 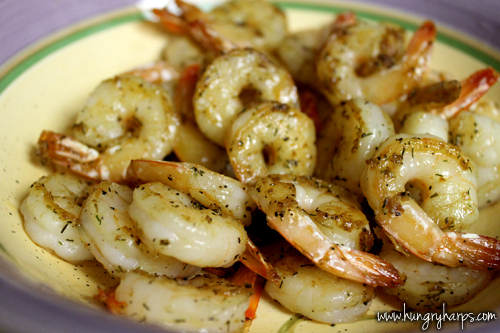 Mix together mustard, olive oil and 1 teaspoon of seafood seasoning. 4. 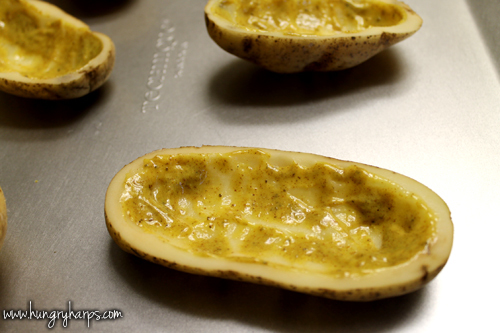 Brush insides of potato shells with mustard mixture and place on baking sheet. Bake for 30 minutes or until potatoes are tender. 5. 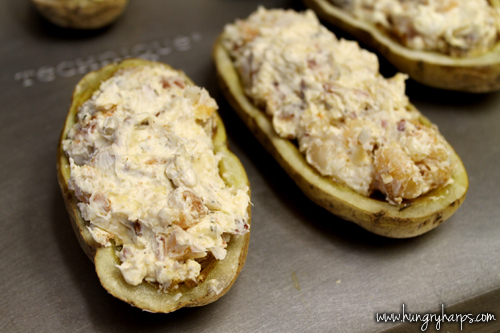 Mix together 1 teaspoon seafood seasoning, shrimp, cream cheese, gouda cheese and bacon. 6. 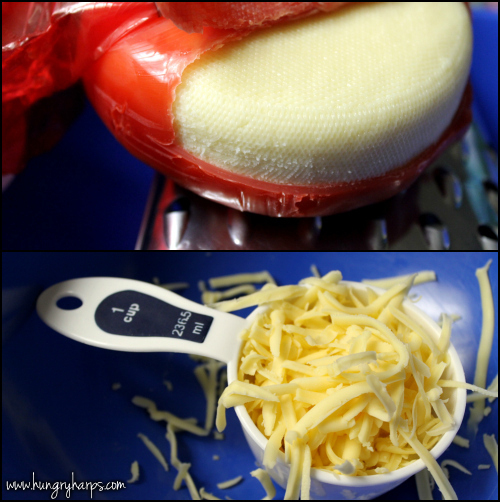 Fill baked potatoes with cheese mixture and bake 10-15 minutes more, until cheese is melted and starting to bubble and brown. Sprinkle chives on top and enjoy! 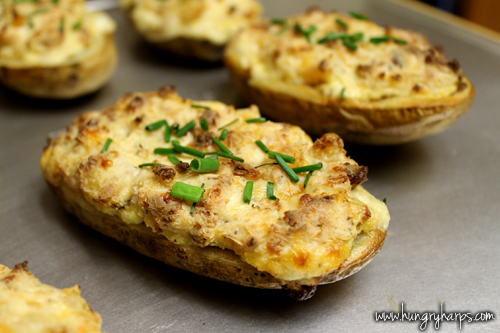 What a nice change from the regular stuffed potatoes! 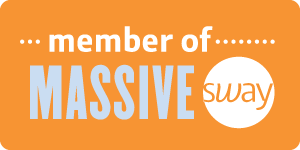 They look great :) Thank you for sharing it last week at All my Bloggy Friends - I can't wait to see what you link up at this week's All my Bloggy Friends!